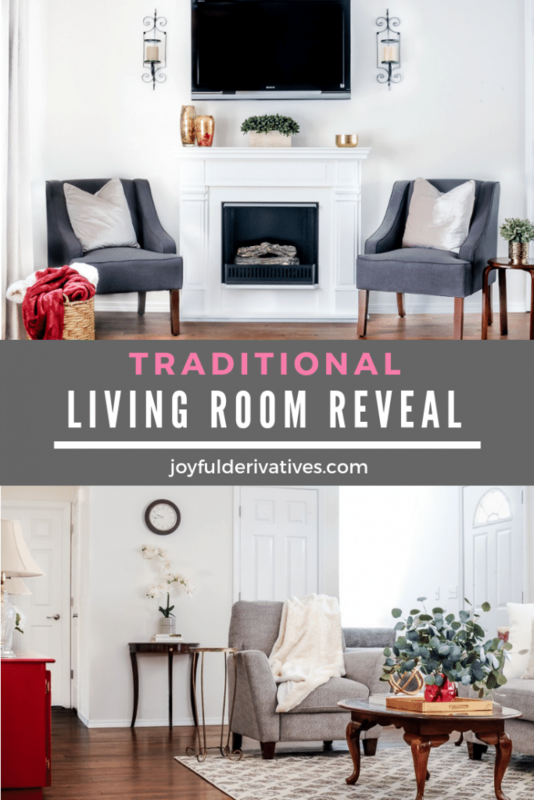 Joyful Derivatives » Blog » Decor Inspiration » Traditional Living Room Makeover – Fall ORC Week 6 – The Room Reveal! 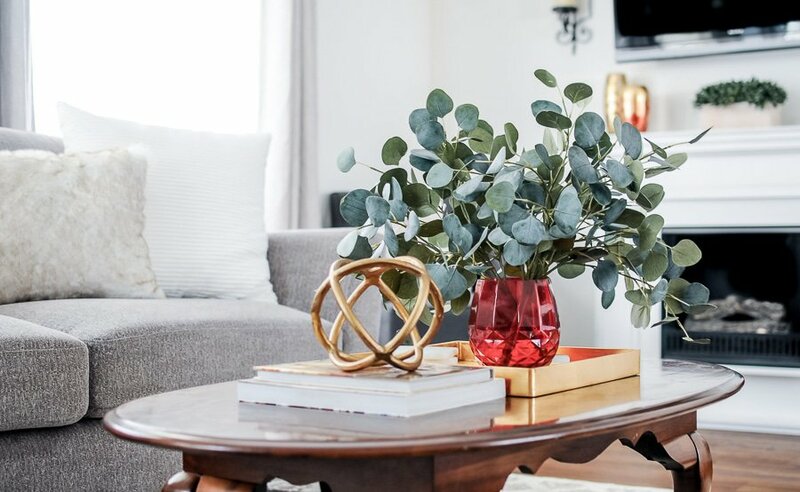 Traditional Living Room Makeover – Fall ORC Week 6 – The Room Reveal! 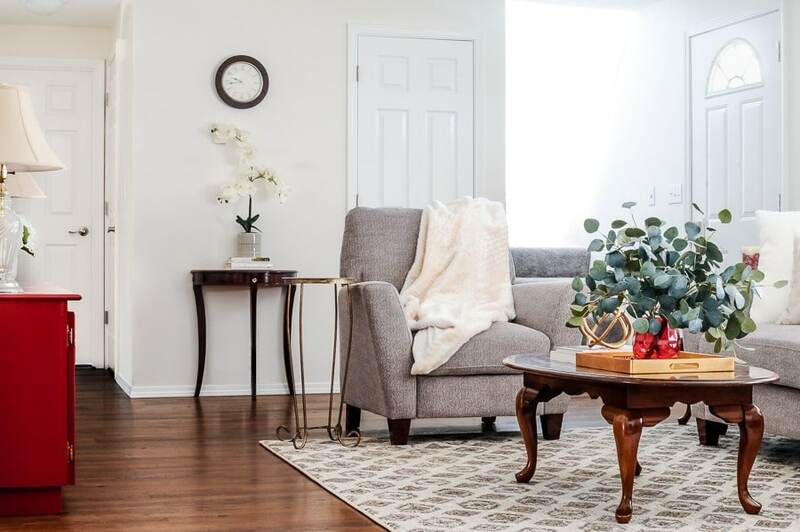 After 6 weeks of intense work, we’re finally ready for our living room makeover reveal! 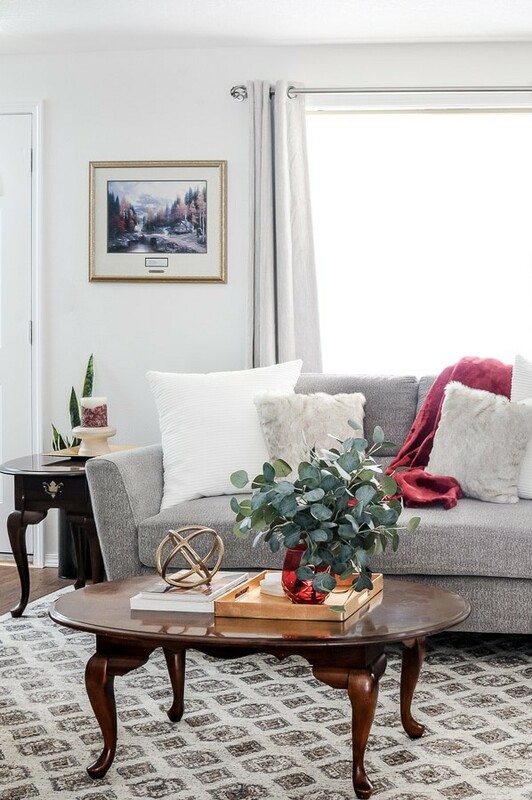 Come take a tour of the beautiful, traditional living room we created as part of the fall season of the One Room Challenge. 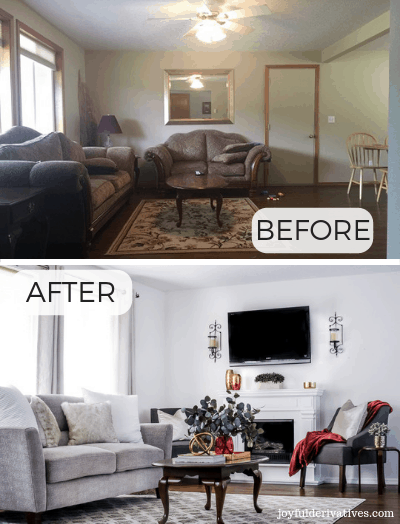 The transformation in this room reveal is incredible! It’s the moment we’ve all been waiting for… reveal day is here! 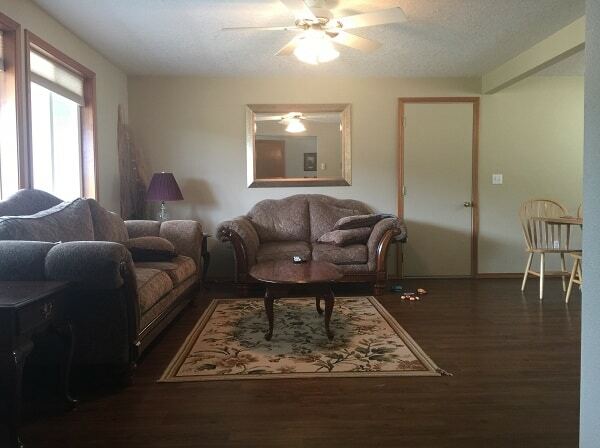 I am SO excited to show off my in-laws’ new living room. I know I always say this, but all the hard work and late nights were TOTALLY worth it. 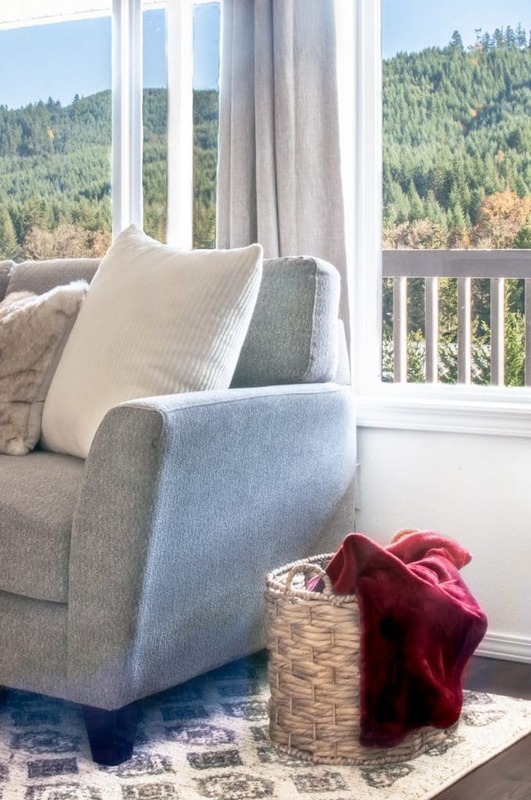 Their room that was once dark and dingy is now bright, beautiful and cozy! Before we start, I just have to take a minute to thank my husband Chris and my in-laws for all of their hard work on this project! 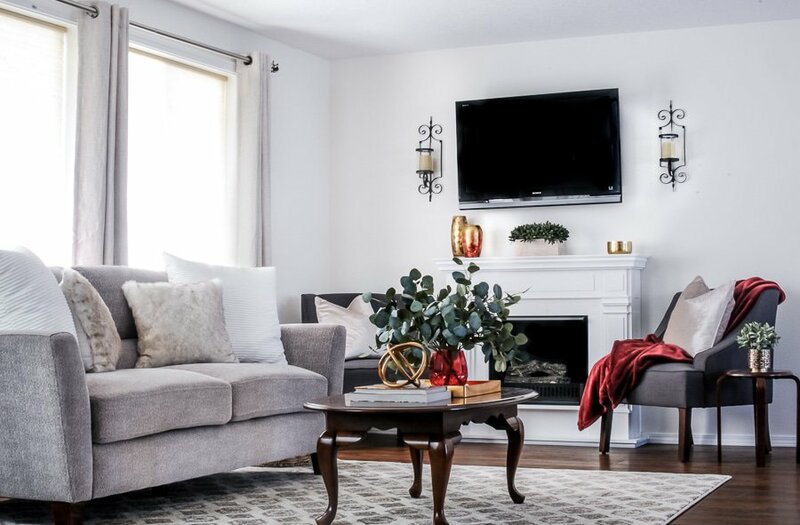 Without the help of those three (in reality, most of this room makeover was physically done by them) this makeover wouldn’t have been possible. They were awesome team mates and I’m so proud of them! If you are joining me from the ORC site, welcome! 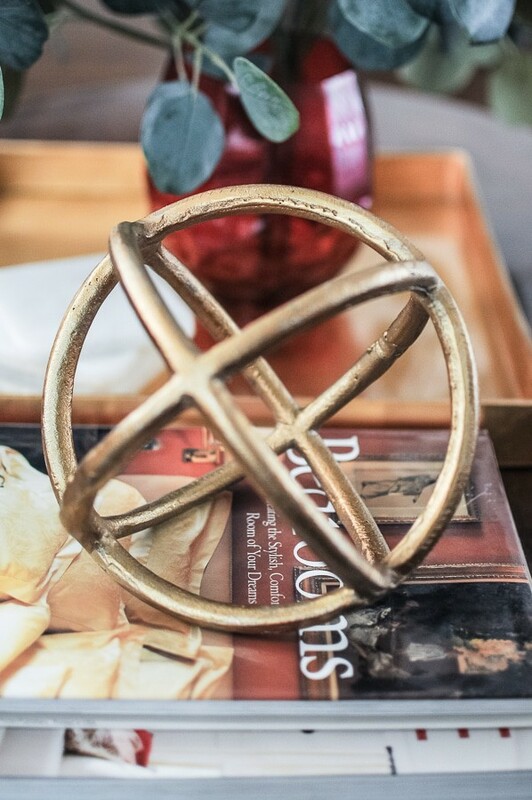 I’m Rachel Joy – interior designer, DIY addict, and home renovator. 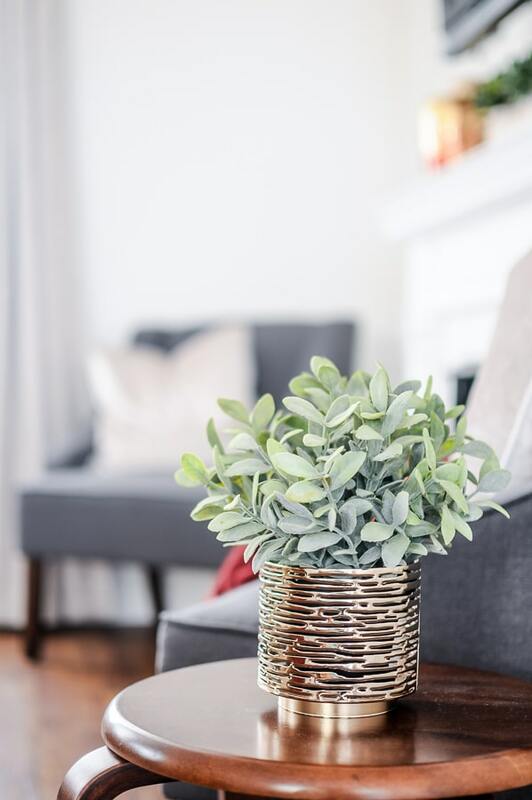 Here at Joyful Derivatives, I teach simple and affordable ways to create a home you love to spend time in and are proud to share with others. I’m so glad you’re here! New to the ORC? Let me explain! 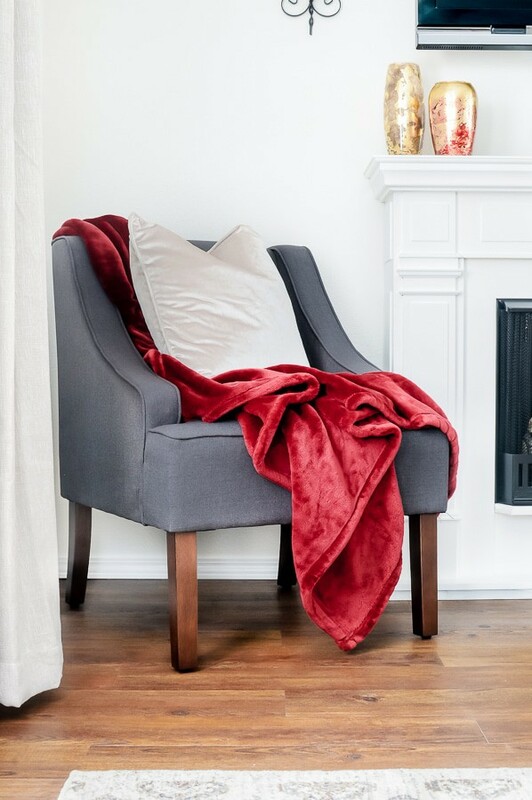 The One Room Challenge is a bi-annual event with 20 featured designers and close to 200 guest participants (including me!) that all work through a room makeover in the six week season. This is our third season participating as guests and it’s by far one of my favorite events to participate in as a designer and blogger. The design talent displayed in the room makeovers is truly inspiring! 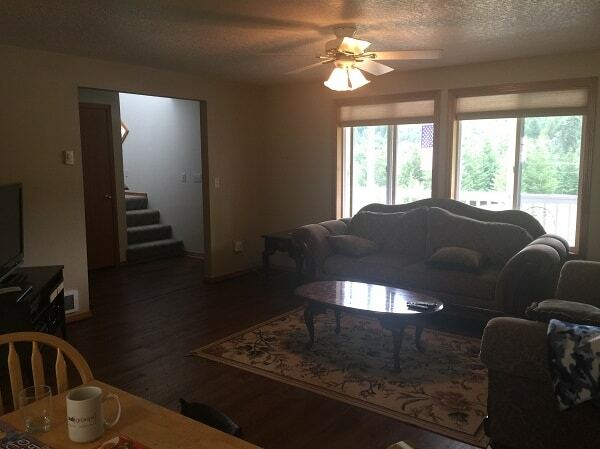 My in-laws bought this home about a year ago when they were unfortunately forced out of the prior home by HOA bullying (more about that here) and they’ve since been working hard on building and establishing their business. With the work load involved in building a business, they’ve not had time to work on the renovations and decorating of their new home. 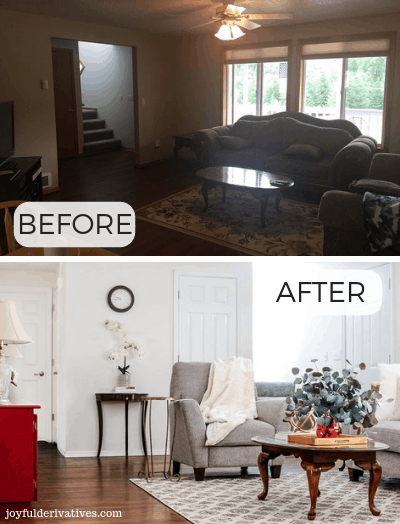 Which is why Chris and I offered to help them with this living room makeover! 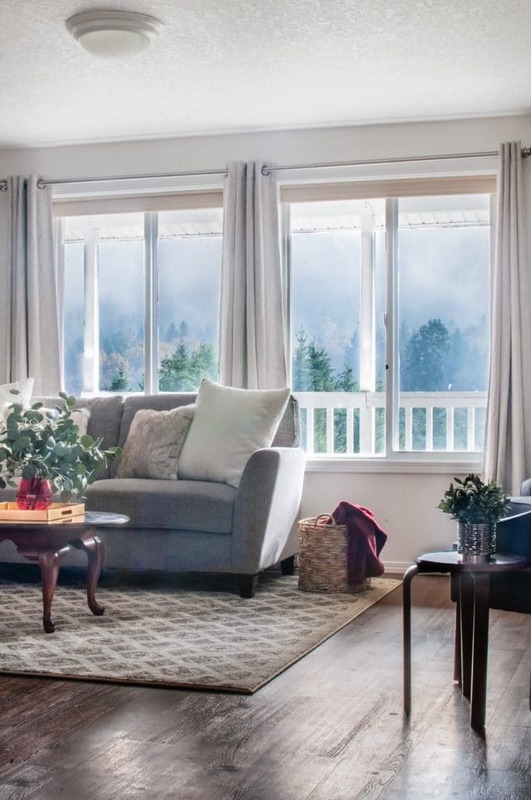 With those pain points in mind, Chris and I worked with my in-laws to put together a room design (mood board) and a project task list to keep us on track throughout the six weeks. Welcome to their new living room! Isn’t it stunning?? 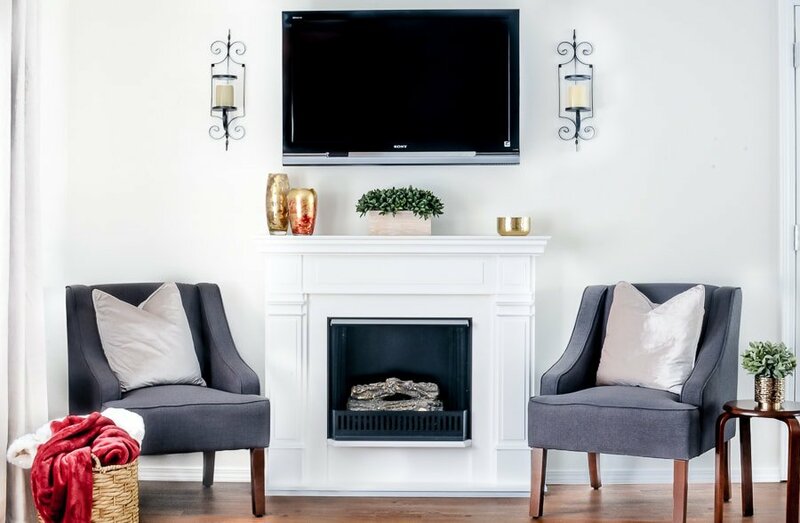 The faux fireplace is my favorite part of this whole space. I still can’t believe we got it for just $50 at a garage sale! 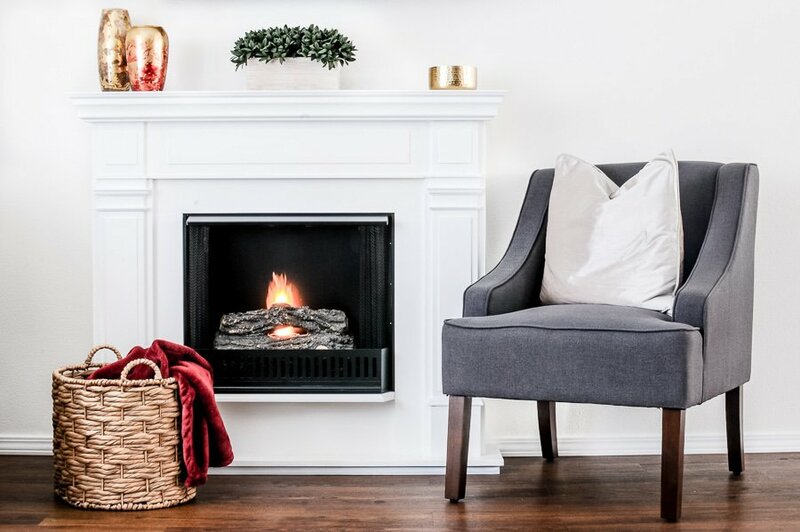 The charcoal accent chairs were sponsored from HomePop and, paired with the velvet pillows and blanket basket, they add the perfect touch of sophistication and comfort next to the fireplace. On the other side of the room (where we removed the wall) you can see how much light now flows in from the staircase and how much brighter the space is with the new white doors. Which leads us over to the red credenza! It’s excellent storage for my mother-in-law’s china dishes and decor, and the red paint makes it the perfect pop of color in a relatively neutral space. 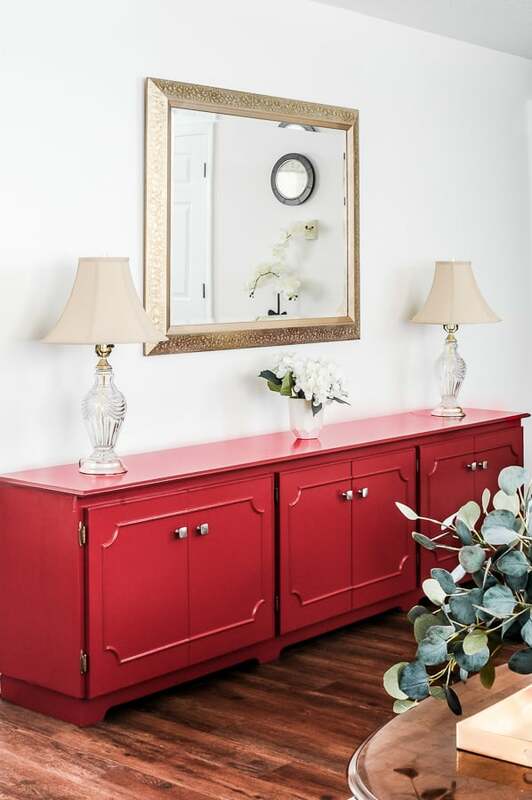 We added gold and red accents throughout the space to tie in the credenza and mirror. 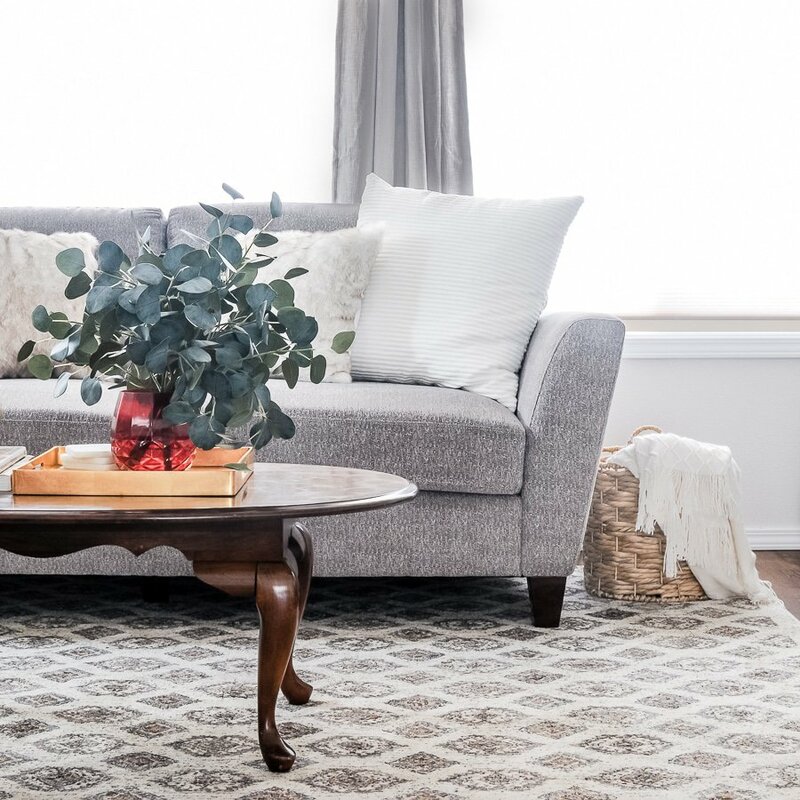 The rug was sponsored from Mohawk Home and is perfect for the room. 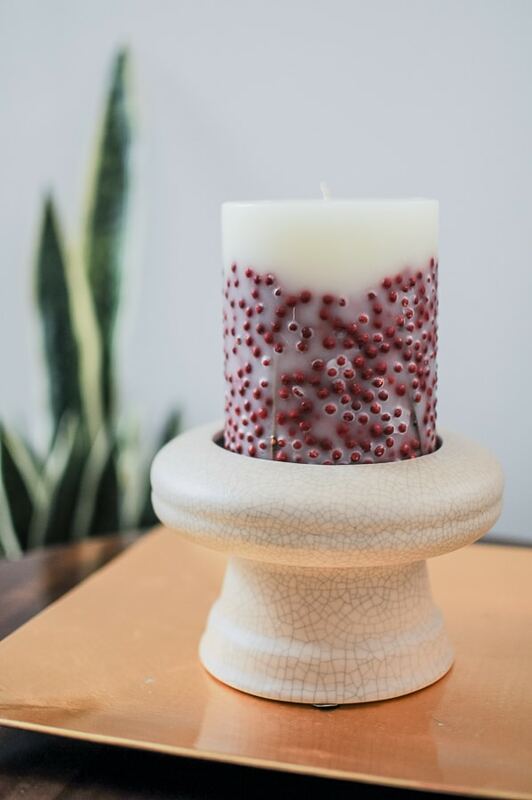 It’s a beautiful cream color with hints of green, brown and deep red. I also love that the pattern has just enough detail to create interest without being overwhelming. Want to know a secret? See that faux snake grass plant near the front door? It actually has a whole drilled into the bottom of it so that it can sit on top of a capped propane pipe coming up out of the floor! It was a brilliant way to hide an eye-sore! The sofa and recliner my mother-in-law chose are just the right size for this room, giving plenty of seating without taking up too much space. 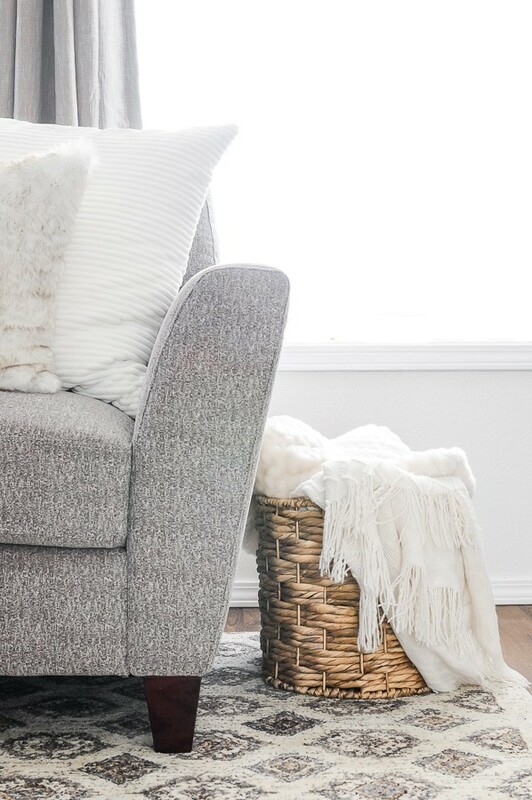 Their fabric is technically grey but has some white, cream and brown tones too making it the prefect color for this space. My mother-in-law already owned the cherry tables (entry, side and coffee) and I like that the curves of their legs along with the curve of the arms on the accent chairs add dimension to the room otherwise filled with straight lines. The view from their front windows is AMAZING, so I couldn’t resist taking a few pictures to show it off! Now, tell me this fireplace doesn’t look like the real thing! It came with these incredible cans of gel that burn a real flame that crackles and gives off heat. I am seriously impressed with it. And lastly, a HUGE thank you to everyone that made this possible! To FrogTape, our official sponsor this season – we couldn’t have done it without their support and their tape! We used so much of their painter’s tape throughout this project (I even used it to hang sheets over windows for my photo shoot! ;)) and we highly recommend you grab some for your next painting project. To our other brand sponsors – HomePop, HANDy Paint Products, and Mohawk Home. To Linda from Calling it Home for coordinating and the ORC media sponsor Better Homes & Gardens. And of course, thank YOU so much for following along on this room makeover journey and stopping by for the room reveal! Don’t forget to check out the reveals from all the featured designers and other guest participants too! « DIY Kitchen Makeover Ideas that will Transform your Kitchen on a Budget! What a blessing for your in-laws! The space looks beautiful and I’m sure they are thrilled. Well done!! Great job! It really looks amazing !